This month D&D Insider (Wizards of the Coast's D&D digital magazines) has the theme of royalty and romance. Mostly, it's royalty and nobility. 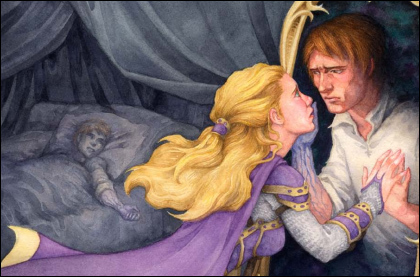 But I had the opportunity write an article about themes of love in Dungeons & Dragons...so I totally took it: "D&D Love Stories"
At a glance, you'd think this topic might be, at best, mildly interesting and, at worst, lovey-dovey or maudlin. I strove for very interesting, and I hope it delivered that to some gamers. First and foremost, love in the D&D world doesn’t have to be sappy. This is a realm of magical fire and ringing steel, of physical transformations and powerful rituals. Love could be the catalyst for a paladin’s quest, a rogue’s heist, or a wizard’s research. A villain might be motivated by unrequited love or a personal betrayal. And why not? Kings have been slain for less. Monsters and villains can have motivations and goals, and their interest in the heroes might extend beyond "food that walks" to something more personal. Which is more fun to play—having the heroes chase down a bog hag because a local lord is hiring them to do it, or having them chase her down because she impersonated the eladrin warrior’s lover during the previous adventure and locked up the real one in an oubliette somewhere in the Feydark? Dark Demise: The love interest of one of the heroes is killed. The mysterious nature of his death, however, prevents the Raise Dead ritual from working—for whatever reason, the subject’s soul is not "free and willing to return to life." But all is not lost. A shadar-kai mystic approaches the characters and tells them that the man’s spirit can be recovered and returned to life. He gives them a strange map and brings them to a place where the borders between the mortal world and the Shadowfell are thin. In the manner of Orpheus from Greek mythology, now they must venture deep into the underworld of the planes and bargain for a lost soul.